Bedford Blues were unable to end their season with a win as they succumbed to a 26-17 defeat to Nottingham at Goldington Road on Saturday. The majority of the 2,517 in attendance were hoping to see their Blues side sign off with a victory but the visitors, who missed out on the play-offs by just five points, put in a professional performance to secure victory on the final day of the Greene King IPA Championship campaign. Two first-half Nottingham tries from Billy Robinson and Ryan Hough helped them to lead 15-3 at the interval, as despite a brace from Blues’ Pat Tapley, Mike Rayer’s side were sent to their sixth home defeat in the league. Early on, fly-half Jake Sharp performed a lovely show and go to gain some good yards in midfield for Bedford, before eventually forcing a penalty that the former Saracens man easily converted after eight minutes to give the Blues a 3-0 lead. Just two minutes later, Nottingham’s Conor Carey was given a yellow card after collapsing a scrum only seconds after being warned not to do so again by referee Andrew Small. Despite the numerical advantage for Bedford, it was the Green and Whites who scored the only points in the next 10 minutes. Substitute Will Maisey, who racked up 14 points in the return fixture on the opening day of the season, punished Bedford for entering a maul through the side – and as a result levelled the scores at 3-3 with his first penalty of the match. 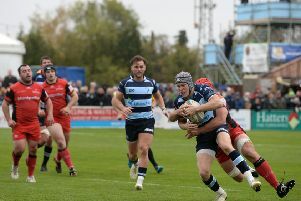 Poor handling from Bedford prevented any phase after phase attacks in the opening exchanges and because of that, it was the visitors who scored the first five pointer at a sunny Goldington Road. Forcing their way over the gain line, Nottingham trundled their way into the 22 before spotting a three on two overlap on their right wing. Good hands moved the ball quickly to find full-back Robinson in space who, just about, grounded the ball inside the touchline. The visitors had pace throughout their back line, and their second try proved how potent they can be. Winger Pila Iongi showed a great turn of speed to accelerate past the Blues defence on halfway, before the Tongan nonchalantly stepped past Steffan Jones to gallop towards the line. Bedford’s Dean Adamson is no slouch himself and somehow managed to catch him up, but Hough was on Iongi’s shoulder to receive a short pass and finish off a superbly taken try. The score was greeted with applause from the home fans because of the quality, but they were disappointed to see their Bedford favourites enter half time 15-3 down. Going into today’s match, 21 of the Blues 32 tries this season have come after the break, so those in attendance knew the game was far from over, but on 43 minutes Nottingham really put the pressure on the home team. A strong maul off the back of an attacking line-out allowed second-row forward Toby Freeman to collapse over the white wash with the ball in his hand to stretch his sides lead to 17 points. Referee Small handed out his second yellow to a Nottingham player on 46 minutes when Thomas Calladine put in a high tackle on Nick Fenton-Wells, and that seemed to galvanise the Blues into action, just two minutes later, Tapley grabbed his first try. Jones made a good break in midfield before freeing Adamson on the left, the former Ampthill man made good yards but was stopped by covering defence just 15 metres out. With quick ball though, Bedford struck as Sharp provided an elegant popped pass for Tapley, and with the winger running a cutting angle, he scored to give the Blues hope of another comeback. The home side knew they had to score the next try if they were to win the match, and with their set-piece dominating their opponents, their second arrived on the hour. A number of tap and go penalties unorganised the visitors defence, and the ball was spun left where Tapley and Adamson were awaiting the ball. The number 14 decided to go himself, sprinting over to score his 15th try of the season to the delight of the Blues fans. With Sharp converting both tries, it was just a three point game going into the final quarter. However Nottingham spotted their weakness in their set-piece and replaced their whole front row, with the fresh legs meaning they were on the right end of the decisions going into the final 20 minutes, and they forced their way into the Blues half as a result of the numerous penalties. Two more Maisey penalties meant the score was 26-17, and after a long hard season, Bedford were unable to fight their way back as they ended up finishing in 10th place. Bedford: Camilo Parilli-Ocampo (Tom Williams 43), TJ Harris (Charlie Clare 43), Phil Boulton, Mike Howard (Paul Tupai 51), Harry Wells, Hayden Thompson-Stringer (Matt Hankin 51), Josh Buggea, Nick Fenton-Wells (c); Darryl Veenendaal (Luke Baldwin 59), Jake Sharp, Dean Adamson, Ollie Dodge (Henry Staff 59), Mike Le Bourgeois, Pat Tapley, Steffan Jones (Baden Kerr 77). T: Pat Tapley x2. C: Jake Sharp x2. P: Jake Sharp. Nottingham: Campese Ma’afu (Jon Vickers 59), Shaun Malton (George Porter 59), Conor Carey (Michael Holford 76), Toby Freeman, Tom Price, Rupert Cooper (Matt Everard 56), Tom Calladine, Paul Grant (c); Sean Romans (Alex Smit 76), Dan Mugford (Will Maisey 13), Pila Iongi, Javiab Pobe, Joe Munro, Ryan Hough, Billy Robinson. Replacement not used: Ed Styles. T: Billy Robinson, Ryan Hough, Toby Freeman. C: Will Maisey. P: Will Maisey x3. Assistant Referees: Darryl Chapman and Simon Adams.